Bento sets, burgers, noodles, rice dishes and more, oh my! So many choices, so little stomach space! 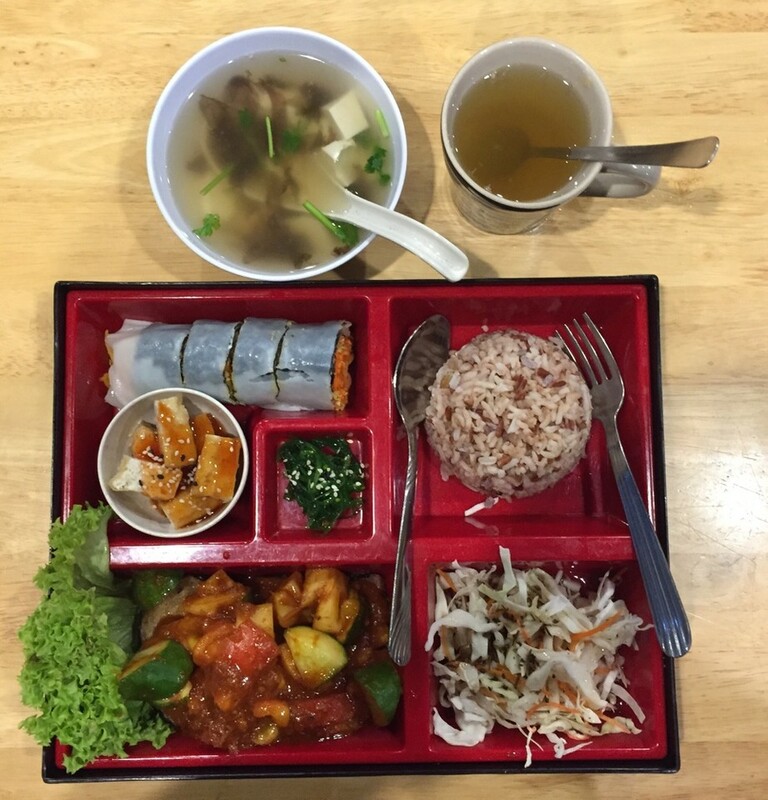 In the end, I plumped for the spicy Thai “fish” bento set because it looks like it has a little of everything. And what a carnival of flavours and textures it was! There were thankfully only 3 pieces of mock fish (soy-based, wrapped in seaweed), the rest are all vegetables — pineapple, tomato, cucumber and lettuce. The coleslaw came with a piquant vinegary dressing, the fried tofu cubes came with a sesame and chili sauce dip, and the wakame seaweed seemed not to match anything else in the set meal but surprisingly complemented everything all the same. The veggie roll is rather unusual as it is wrapped in nori seaweed and a soft chee cheong fun noodle roll, not a vietnamese rice wrap or a popiah skin. It is filled with julienned carrots and jicama seasoned with a savoury nutty sauce. Most delicious! The set came with a nori and tofu soup and a kumquat drink. I had also ordered a fresh apple and celery juice and my total bill came up to RM19.60 after the Kindmeal.my discount. I’d rate this particular meal 4.5 out of 5 stars because there was frankly way too many things going on in one set meal and I would have liked more rice to mop up the side dishes with, but then again this is just one diner’s personal opinion. Service was excellent, and the meal was tasty, wholesome and good value for money. I’ll be back soon to try the other dishes. Thanks for the kind and constructive feedback, EeLynn. The reason why we have a smaller bowl of rice is because we have most customers prefer to enjoy the varieties that comes with the set than to consume more rice, but if you would like to have more rice, feel free to let us know without extra charge. That looks like a very interesting combo! Thanks for the recommendation, will try soon! Thank you for sharing your delicious experience at Lohas Bistro! Lohas Bistro, thank you so much for your kind offer! I will be sure to remember that! I want to come try your other dishes soon!